01V96, Console numérique de la marque Yamaha appartenant à la série 01V. Yamaha's flagship digital mixing consoles are the accepted standards throughout the world: the awesome PM1D for sound reinforcement, broadcast, and theater; the DM2000, DM1000, and 02R96 for sound and music production. Now the 01V96 brings you the same performance and reliability in a smaller, more affordable format that's perfect for the home or smaller professional production studio. 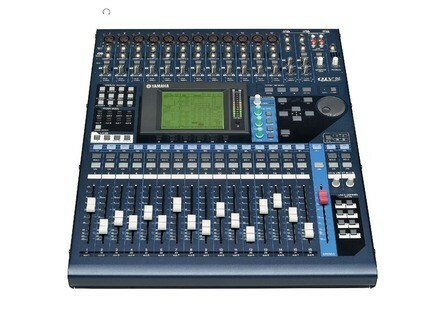 Still, it has a maximum 40-channel input capacity and can be cascaded for applications that require more. And, of course, 24-bit/96-kHz operation is standard. Mixer functions and effects are all inherited from the top-of-the-line DM2000, so you know you're getting the best. Prepare to be amazed at how far Yamaha digital evolution has come. If you thought that cutting-edge digital mixing and processing performance was still beyond reach, here is a very good reason to smile. You simply won't find another digital console this compact and affordable that offers this much performance and flexibility. The 01V96 fits comfortably in the small-studio space - and budget while delivering sound, capacity, control, and compatibility on a par with much larger consoles. Digital audio technology has come a long way since the early days of 16 bits at 44.1 kHz - a format that many considered to be the reason for "harsh", "cold" sound. The entire industry is now settling on 24-bit/96-kHz digital operation for significantly superior sonic quality. The 01V96 does give you a choice - you can work at 44.1 kHz, 48 kHz, 88.2 kHz, or 96 kHz, depending on the needs of each individual project. But when you want the truly transparent, incredibly dynamic sound of 24-bits at 96 kHz, the 01V96 is ready to deliver. It even includes a comprehensive range of superb 96-kHz compatible stereo effects with 32-bit internal processing. Right out of the box the 01V96 gives you 16 analog channel inputs - 12 with high-performance microphone head amplifiers - and eight digital channel inputs via a built-in ADAT optical interface. The first 12 analog channels will accept microphone signals or balanced/unbalanced line-level signals, while the remaining four channels can be used either as individual balanced/unbalanced line inputs or two stereo pairs. Without going any further you're ready to handle a comprehensive mix of analog and digital inputs. When you need more, Yamaha offers a range of Mini-YGDAI expansion cards that can simply be plugged into the 01V96 expansion slot to provide additional I/O in a variety of formats: ADAT, AES/EBU, TDIF or analog. Click here for more information and guidance on the use of mini-YGDAI cards. The 01V96 offers a main stereo program bus, eight individual mixing buses, two solo buses, and eight auxiliary buses - a total of 20 in all. 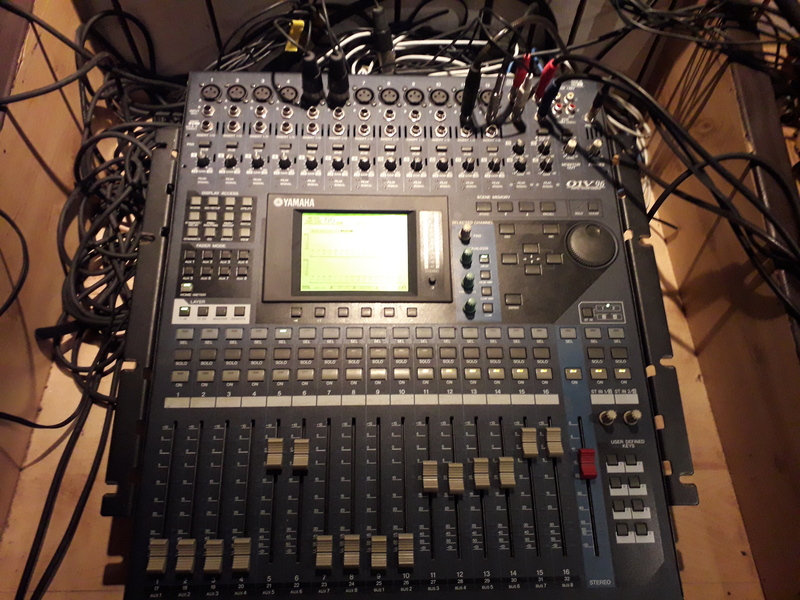 This gives you plenty of signal-routing options to adapt to just about any mixing requirements. The 01V96 comes with an industry-standard ADAT optical digital I/O interface built right in - no options necessary. ADAT "Lightpipe" optical I/O is standard on a wide range of current digital sound gear, so you can simply plug in via optical cables for 8 digital inputs and 8 digital outputs that will handle your digital signals without compromise. Additional optical I/O capacity can be added via the 01V96 expansion slot, as necessary. All available inputs, outputs, effects, and channel inserts can be assigned to any of the console's channels or outputs via the 01V96's remarkably versatile, easy-to-use digital patching system. For example, any of the effect processors can be assigned to an auxiliary bus for send-type operation, or inserted directly into any input channel as required. A direct out function also allows the signal from any of the input channels to be routed directly to any digital or analog output. The eight auxiliary buses can also be patched to anywhere in the system. Centralized control means you'll never have to run around to physically re-patch cables whenever you need to reconfigure the system, and patch setups you might want to use again can be stored in the 01V96 "patch library" for instant recall at any time. Complete console setups can be memorized and instantly recalled via the 01V96 SCENE MEMORY controls. Memory is provided for up to 99 scenes. In addition to recalling scenes from the panel controls you can recall them remotely via MIDI program change messages, providing a handy degree of automation capability. The 01V96 has been designed to integrate tightly with leading digital audio workstations to create a complete production and mixing environment. Extensive support is provided for Digidesign's Pro Tools® system as well as Steinberg's Nuendo® DAW - full control of mixing and processing parameters, as well as transport/track-arming control and access to editing functions - directly from the 01V96 control surface. There's also a "General DAW" mode that provides compatibility with other workstations. 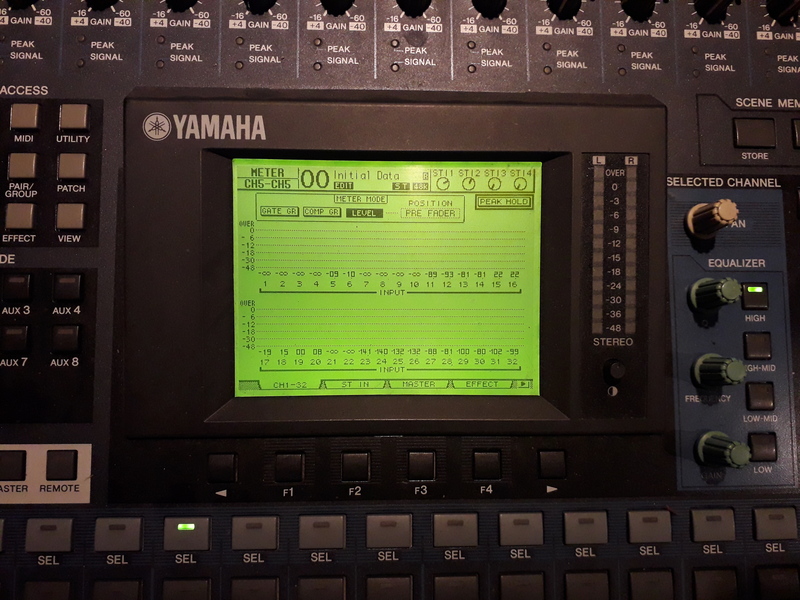 You could use external digital effect processors with the 01V96, but what's the point when it features top-performance 24-bit/96kHz effect processors built-in? Also, you're going to compromise audio quality if you have to convert down to a lower sampling rate for effect processing - which is exactly what's going to happen if you use hardware or software processors that don't offer 24-bit/96kHz performance anywhere in your signal chain. That's why Yamaha included a comprehensive range of 96-kHz compatible stereo effects in the 01V96. You can use two effects simultaneously at 88.2/96- kHz, and up to four effects at lower sampling frequencies. All input channels on the 01V96 feature flexible, independent compression and gating/ducking processors for dynamics control. All bands on the 4-band parametric channel equalizers are fully sweepable from 20 Hz to 20 kHz, with bandwidth variable from 0.1 to 10 and a +/-18dB gain range for extraordinary equalization flexibility. The channel delays also go well beyond the norm, with a maximum delay of 452 milliseconds (96 kHz mode). Even the stereo bus, eight mix buses, and eight aux buses have individual compression and EQ! Setting up EQ, compression, and other parameters for a mix from scratch can be a daunting task, so Yamaha has provided an extensive selection of presets in a range of "libraries" that can simply be selected and used unmodified, or edited to suit specific requirements. Libraries are provided for effects, compression, gating, EQ, I/O patching, and channel setups. Of course, your own setups can be added to the libraries for instant recall whenever they are needed. When you really need high capacity - particularly for sound reinforcement applications - the 01V96 offers "01V96 Cascade Link" capability that allows two 01V96 units to be cascaded to create up to an 80-channel mixing system at an unbelievably affordable price! Surround is becoming an important part of modern sound production. The 01V96 features 6.1, 5.1 and 3-1 surround panning modes so you can create surround mixes without having to sacrifice features or performance in other areas. The 01V96 comes supplied with Yamaha's Studio Manager software application for both Macintosh and Windows platforms. Studio Manager gives you complete access to all parameters for either on-line or off-line control, and the program's visual interface makes it easy to relate on-screen controls to the corresponding console functions. The Studio Manager can also be used to manage an extensive archive of mix data. Even the 01V96 user interface has evolved from the original 01V in many ways, now more closely resembling its big brothers - the 02R96 and DM2000 - in terms of layout and ease of operation. Overall, you'll find that the 01V96 allows analog-style hands-on operation that will contribute to smooth, efficient workflow. There are even eight user-defined keys that can be assigned to functions of your choice. The new 01V96 display is a high-resolution 320 x 240 dot LCD panel that provides easy visual access to all of the consoles functions and parameters. Many parameters are displayed graphically so you can see what's happening at a glance - EQ curves and compression parameters are especially "readable" in this format. The 16 channel strips on the 01V96 panel provide access to the most essential operations for the corresponding channels. Depending on the currently selected layer, the channel strips will control channels 1 through 16, channels 17 through 32, or the eight AUX sends and eight buses (the "Master Layer"). Also the channel faders will function according to the settings in the FADER MODE section. In addition to a 100-millimeter motor fader, each channel strip includes a channel ON/OFF key, a SOLO key, and a SEL key that assigns the channel as the console's "selected channel". Detailed panning and EQ control for the currently selected channel is available via the SELECTED CHANNEL controls. The master STEREO fader is also a 100-mm motor type, with its own ON and SEL keys. One of the advantages of digital control is that it allows extraordinary power and flexibility to be packed into minimum space. 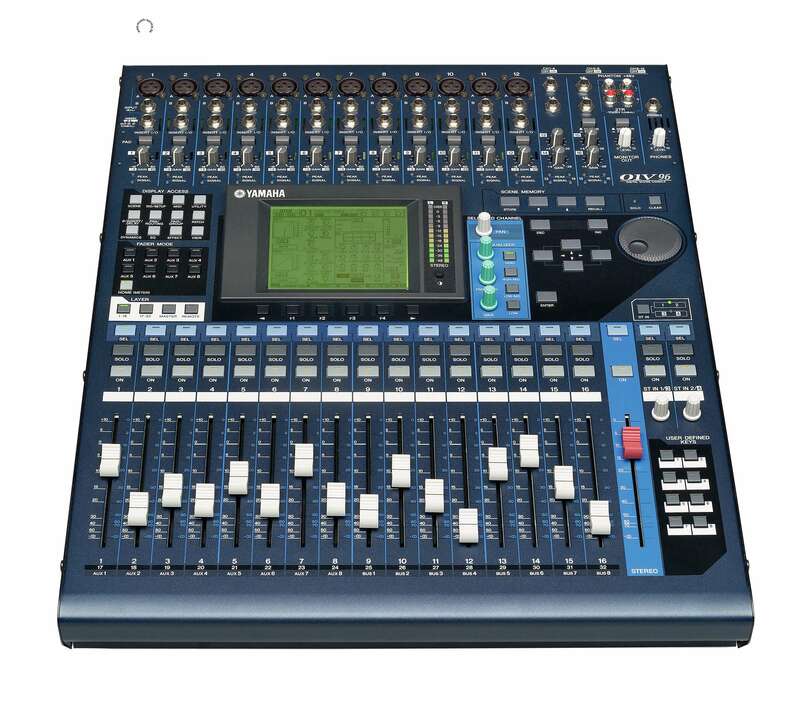 The 01V96 has 17 physical 100-millimeter motor faders. The first 16 can be instantly switched to handle input channels 1 through 16, 17 through 32, or auxiliary sends 1 through 8 and buses 1 through 8, via the console's LAYER switches. There's also a ST IN layer switch that switches between the stereo 1/2 or 3/4 inputs for the stereo layer controls. Having all controls right in front of you at all times not only save space, but it also means that all operations can be carried out without having to move away from the monitoring "sweet spot". The FADER MODE keys allow the 01V96 faders to be instantaneously switched between fader and auxiliary level control. And because the faders feature fast, precise motor-drive mechanisms they immediately respond by flying to the appropriate settings for the selected mode. The DISPLAY ACCESS keys determine which type of data will be shown on the LCD panel - a total of 12 selectable categories. This approach minimizes the need to scroll through on-screen lists when you need access to a particular type of data. The SELECTED CHANNEL controls include the hands-on panning and EQ controls for the currently selected channel, with analog-style buttons and knobs for direct, easy access to the parameters. Need to adjust the high-mid frequency a little? Just tap the HIGH MID key and turn the FREQUENCY knob until you get the sound you want. Here's where you can store all console parameters as a new scene, or instantly recall previously-stored scenes. The current scene number - 01 through 99 - is shown on the LCD panel. Additional scene memories can be managed via a computer running the supplied Studio Manager software. These 8 keys can be assigned to control any functions you choose. You could, for example, use them to recall input patch setups, to arm MTR tracks for recording, or to handle locator functions. When the REMOTE layer is selected, the USER DEFINED KEYS are automatically assigned to Pro Tools® control functions by default. Large cursor, INC/DEC, and enter keys are complemented by a data entry dial that lets you spin in values quickly and easily. The data entry dial also doubles as a shuttle/scrub dial for recorder or DAW control. Most of the 01V96 input connectors are top-mounted for easy access in any application. Inputs 1 through 12 feature high-performance head amplifiers for microphone or line input that deliver a pristine signal to the console's precision 24-bit/96-kHz A/D converters. 48- volt phantom power for condenser microphones is switchable in 4-channel groups, trim controls and pad switches facilitate optimum level matching with the source, and channel inserts make it easy to insert external analog processing gear into the pre-A/D signal path. Inputs 13 through 16 accept line-level signals singly (each input has an independent trim control) or in pairs for stereo input. The rear panel is home to balanced analog stereo and monitor outputs as well as four balanced "omni" outputs. The optical IN and OUT connectors for the 01V96's built-in ADAT interface are also located on the rear panel. There are also digital 2-track inputs and outputs featuring coaxial connectors. On-board sample rate conversion allows CD players and other digital sources connected to the digital input to be monitored or routed to an input channel without having to be synchronized to the system clock. A range of synchronization and control options are available via word clock inputs and outputs, MIDI connectors, and a USB "TO HOST" connector which can be used for computer control via the supplied Studio Monitor software. The rear panel also has an expansion slot which will accept a wide range of Yamaha mini-YGDAI expansion cards that can add up to 16 additional channels in a variety of formats. 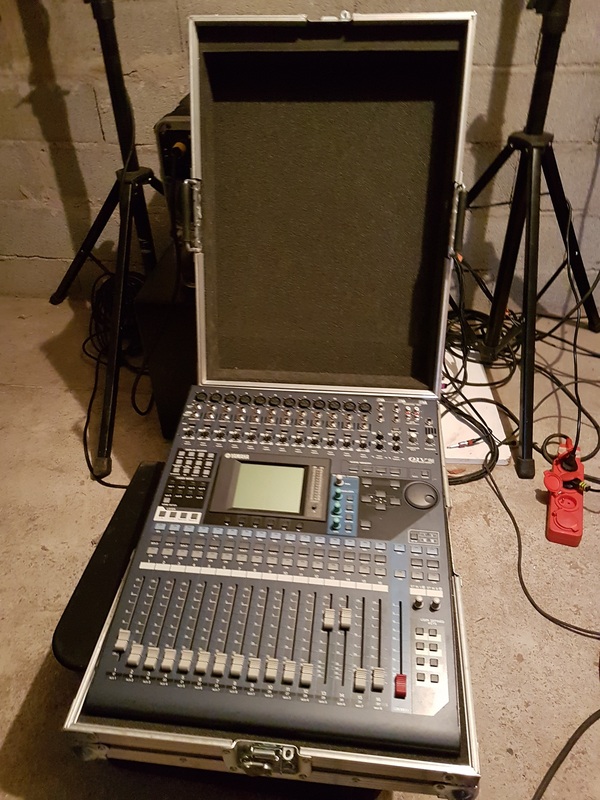 L'avis de guitsou"Très bon produit, un bon produit pour se lancer dans le mixage numérique !" 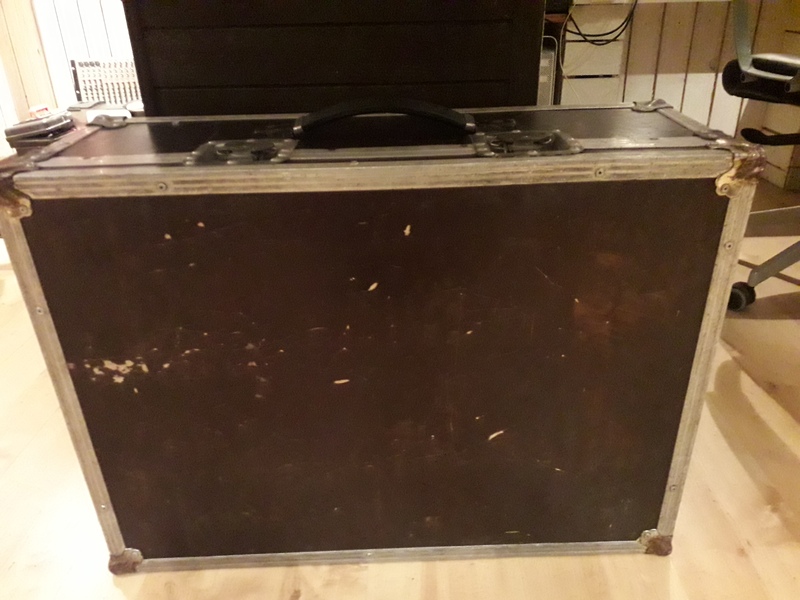 J'ai utilisé cette console pendant plusieurs années pour du live : des concerts et des représentations théâtrales. Elle m'a permis de rentrer dans le monde du numérique. Je l'utilise dans un contexte amateur. Dans sa gamme, cette console est une référence. Les pré-amplis ne sont pas incroyables mais suffisant pour du live, les entrées / sorties permettent de sonoriser la plupart des événements auxquels j'ai dû faire face. On peut compter sur les extensions ADAT pour ajouter des pré-amplis additionnels. La surface de contrôle s'utilise facilement et on n'est pas trop perdu par rapport à de l'analogique, avec plein de fonctions en plus... La possibilité d'avoir un eq paramétrique par tranche, la motorisation des faders, la possibilité d'avoir un gate / compresseur par tranche etc. Après presque 10 ans elle n'a pas beaucoup bougée. Elle a maintenant moins de fonctions qu'une console numérique récente, mais elle reste attractive sur le marché de l'occasion ! Je recommande pour une petite structure, ou un particulier, souhaitant passer au numérique pour pas trop cher. L'avis de FloSon"Une valeur sûre"
Je ne vais pas revenir sur ses caractéristiques. Avec les diverses cartes d'extension (communes à la 02R), on peut presque avoir le beurre, l'argent du beurre et le postérieur de la crémière. Une plongée dans le manuel est nécessaire pour se familiariser avec l'engin. Ce n'est pas simple pour le néophyte mais le jeu en vaut la chandelle, car elle sait tout faire. Je l'utilise exclusivement pour l'enregistrement, couplée à une Profire Lightbridge sur un imac. En y ajoutant une carte E/S, j'ai 16 pistes simultanées en ADAT, ce qui est confortable pour enregistrer des prises « live en studio ». Une fois les présets patiemment concoctés, la console se transforme en tout-terrain, ce n'est d'ailleurs pas pour rien que de très nombreuses petites salles de concert en sont équipées. Elle est sans conteste un de mes meilleurs achats pour l'enregistrement. J'ai toujours envie d'upgrader tout un tas de choses, comme nous tous, mais je n'en vois pas l'intérêt avec cette console. Il y a bien une concurrence, notamment chez Tascam, mais pourquoi se compliquer la vie inutilement ? D'autant plus que mon exemplaire est d'une fiabilité sans faille. En somme, une table semi-professionnelle de grande qualité, que je conseille sans réserves. les convertisseurs sont assez transparent, les preamps de bonne facture, les effets sont honorable pour une utilisation en live, l'EQ en revanche n'est pas très fin, mais quand on connais la machine par la suite, ce n'est plus trop un problème. je l'utilise depuis environ 6 ans en configuration live (environ 200 concert par an) , j'en suis très content, je n'ai jamais eu aucune panne. Beaucoup de possibilités (jusqu'a 32 pistes), routable de manière quasiment indéfinie, Je pense que dans cette catégorie de prix, c'est une excellente console numérique. L'avis de livingstudiocom"exellent quoi que complexe"
YAMAHA 01V96 Différents raccourcis clavier du 01v96 Editor pour Mac et Win. Cela peut toujours servir. Bye.